Machinery vibration leads to shortened machinery life, poor product outputs, and eventually emergency shutdowns. To avoid unscheduled product production watch for these four causes of machine vibration. Imbalance – In the case of rotating equipment, the axis (or shaft) must be equally balanced. An imbalanced axis will create a centrifugal force which causes the machine to vibrate. In some situations the imbalanced can be as simple as manufacturing defects or maintenance issues like missing balance weights or dirty machinery parts. Misalignment – A very common cause of vibration is due to misalignment of rotating shafts. The motor and shaft must be parallel in order for the machine to run effectively. Small degrees of angular misalignment have only minor vibration effects on machinery, but large angular differences can cause significant damage to equipment. Thermal expansion is a big factor in misalignment. Wear – When components become overly worn they can cause vibration in machinery. 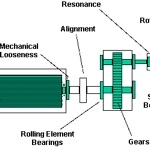 Damaged areas of roller bearings or chipped gears can cause a machine to vibrate. Loose Connections – If a worn part does not become damaged over time it can easily become loose, thus causing vibration. The loose connections can become destructive very quickly, like loose mounts or anchors. As the winter season draws to a close around the nation we want to take this time to remind our readers that seasonal highs for the power industry is expected with the upcoming hot summer season. Small vibration issues can quickly lead to major outages as production is increased. A big cause of major machinery damage is in misalignment. As quotas rise to meet demand misaligned machines can experience high vibration issues.